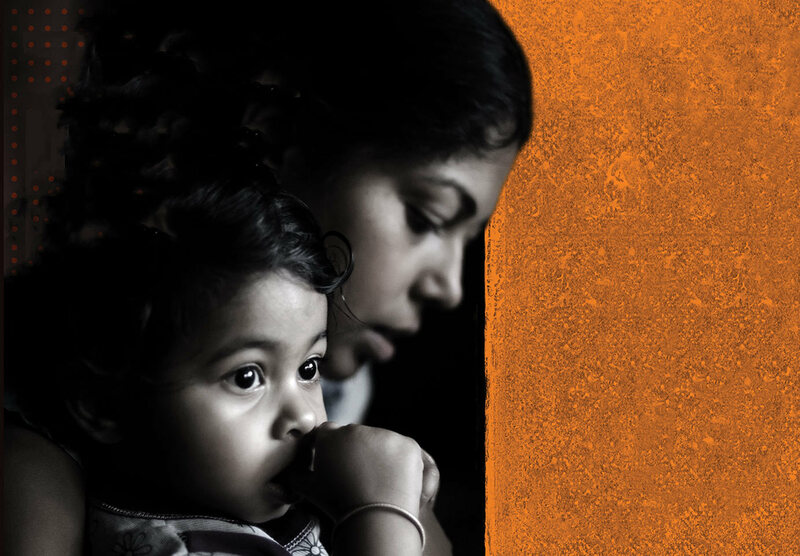 The United Way of Greater Philadelphia and Southern New Jersey (UWP) fights for the success of every child and the stability of every family in our region. The organization is tackling the most pressing challenge facing our region today—intergenerational poverty. 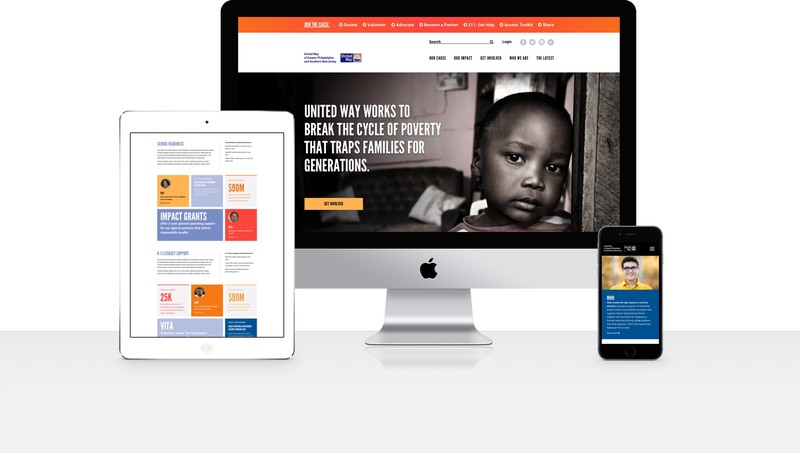 As United Way Worldwide began deploying a significant shift in brand messaging to its affiliates, UWP realized it was the perfect opportunity to reimagine a new website and inspire its audience. 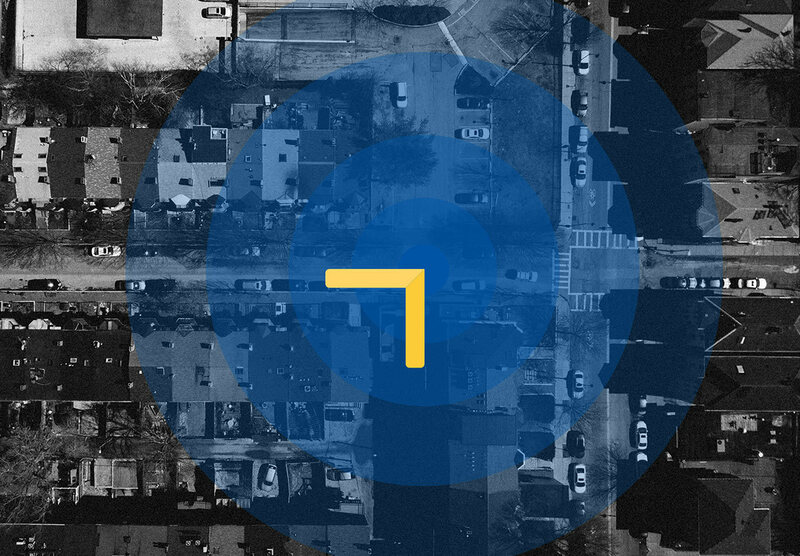 Not only was the existing site design misrepresentative of the current brand identity, but the site lacked a defined structure making information hard to locate. 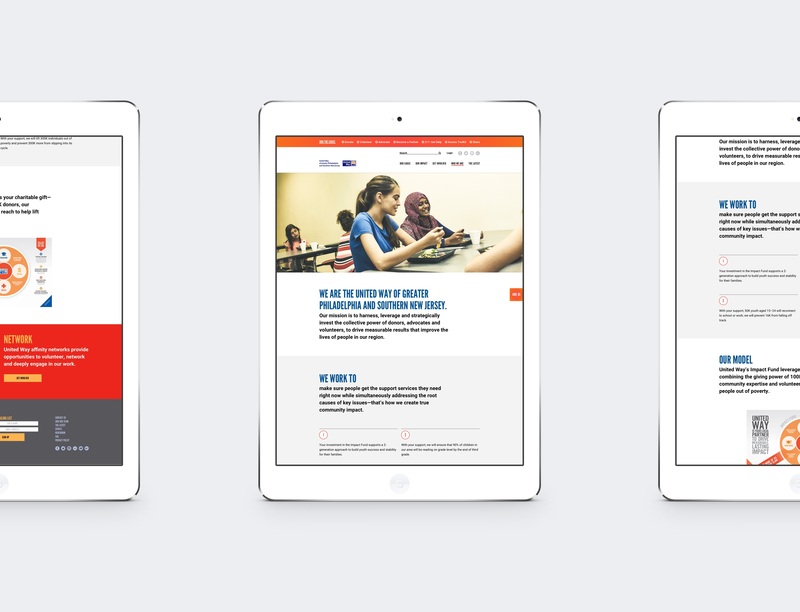 Since Untuck has been fortunate to manage the organization's annual campaign and corporate communications for years, we were eager for the challenge. We began by conducting a full-day workshop with key members of the United Way team to expose common issues with the existing site. We collaboratively identified key user types, primary tasks for completion, measurable goals, and a high-level, best-case-scenario architecture for the new site. User-persona exercises helped the entire team form an empathy mindset—putting the needs, frustrations, and motivations of the end user above all else. 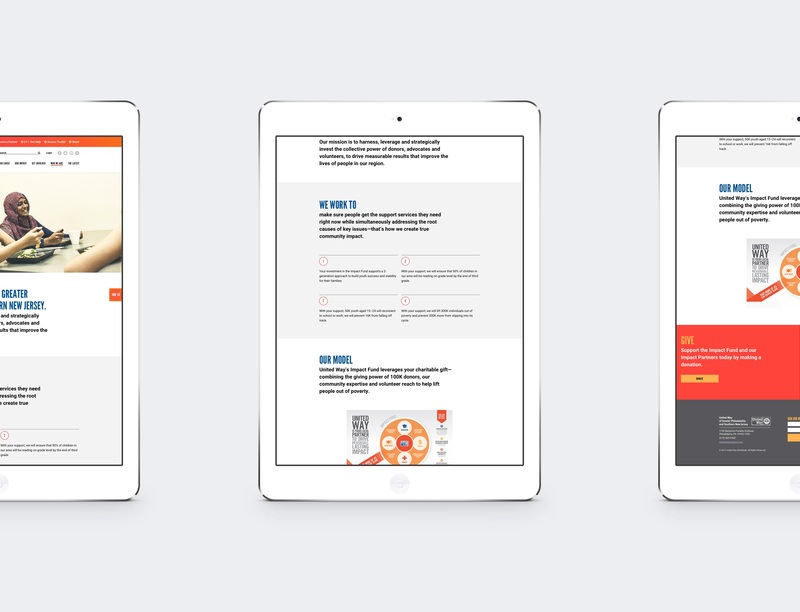 This approach enabled us to develop guided pathways to drive action, establish a clear framework for structuring the content, and create an abundance of ideas around functionality and aesthetics. 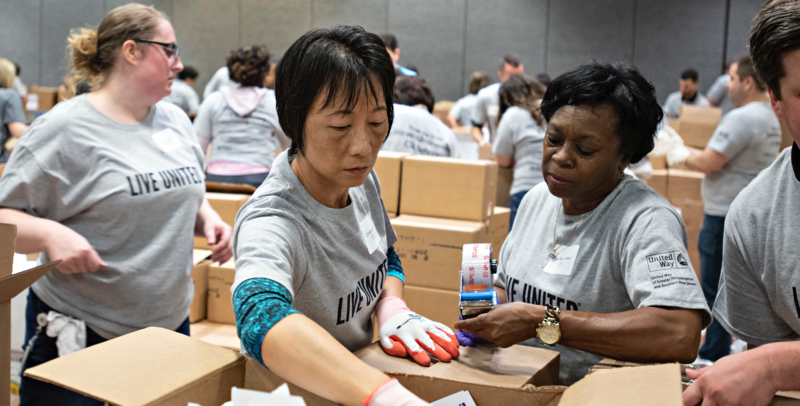 We leveraged recipient, partner, donor, and volunteer stories with supporting data points to demonstrate the real impact of the work United Way and its partners do each day. 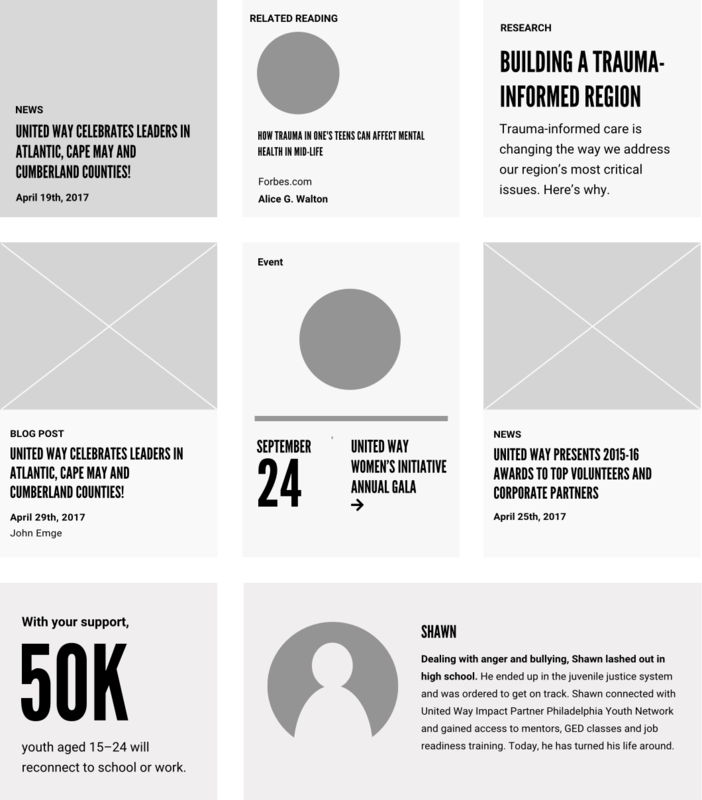 These stories live in a dedicated Impact section and can be displayed individually or in groups throughout the site. Decluttering content and visually conveying the site's architecture were primary goals for our design explorations. 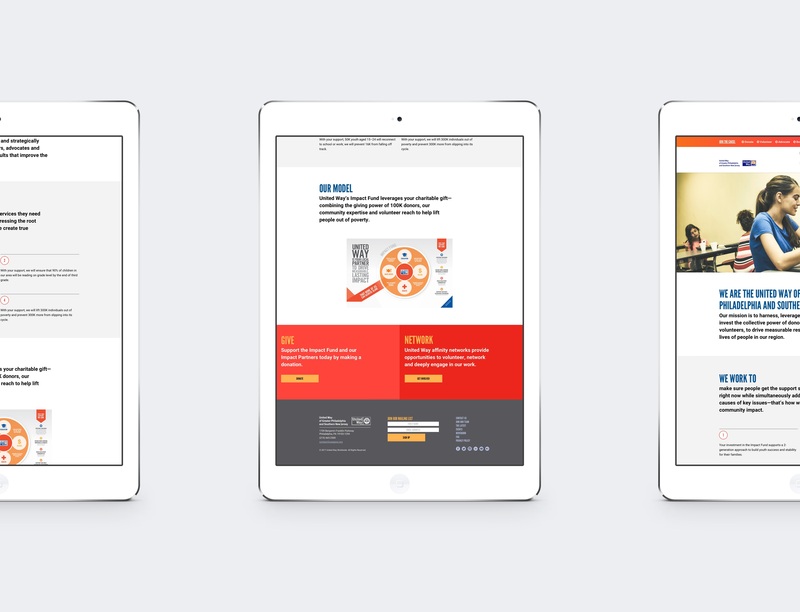 We made all content instantly accessible using an expanding navigation panel that revealed the entire site architecture for the selected section. 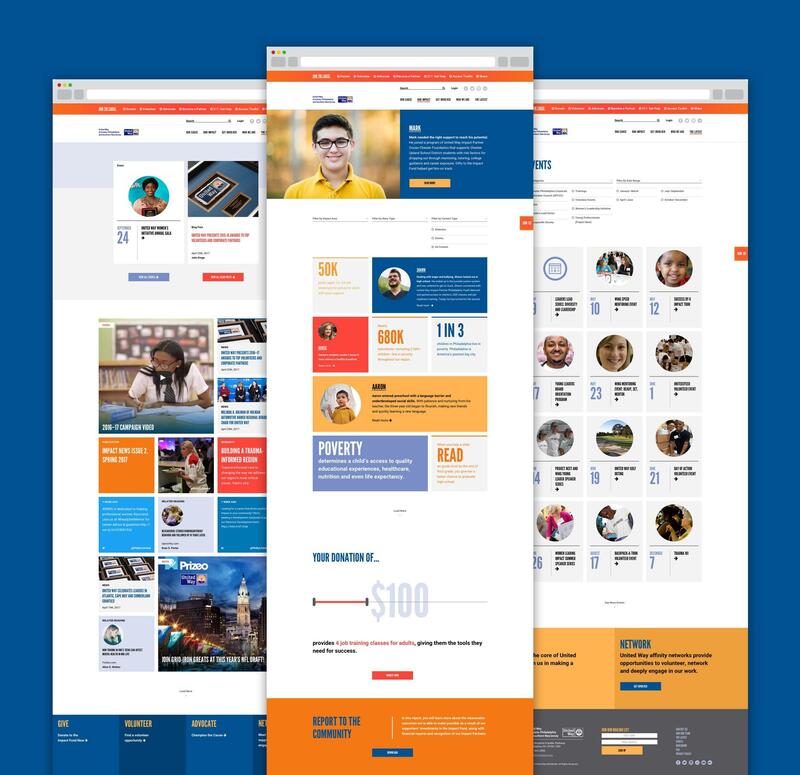 Primary tasks are displayed in an action panel that appears at the top of every page then collapses into a persistent sidebar, encouraging users to join the cause and get involved. 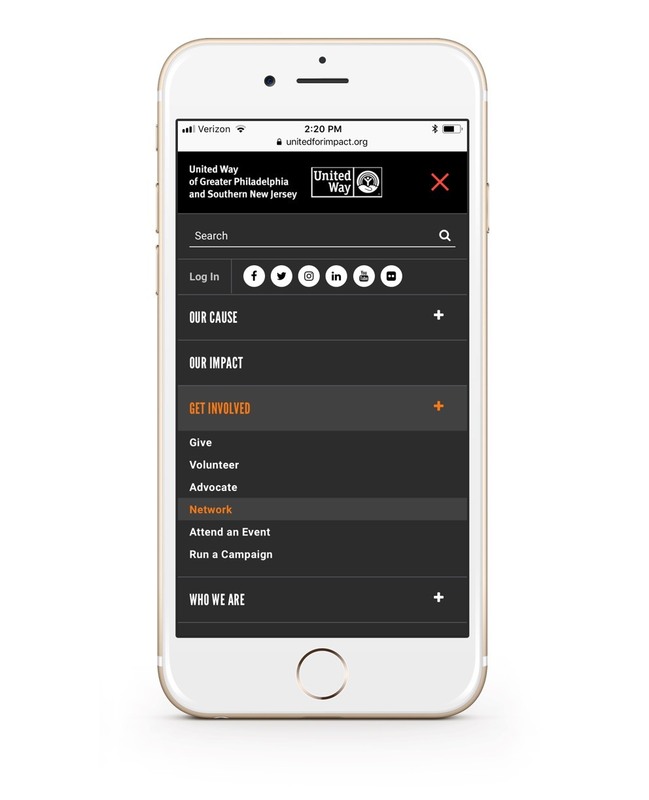 We also built a custom call-to-action (CTA) library that enables the United Way team to apply CTAs both site-wide or page-by-page for total control to completely tailor the experience. 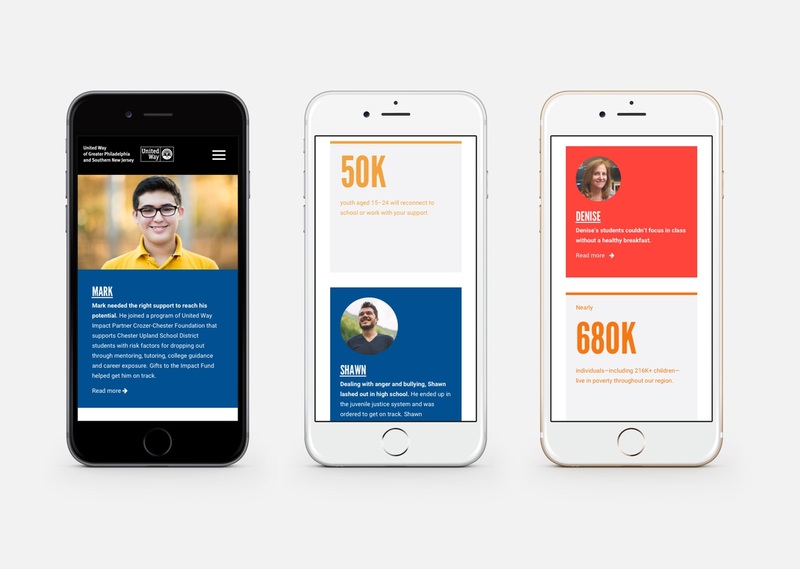 As a large and layered organization, it was vital that UWP's website was designed to scale and pivot as needs changed, stories evolved, or growth dictated. And it had to be customized to meet the expectations of their savvy communications team. 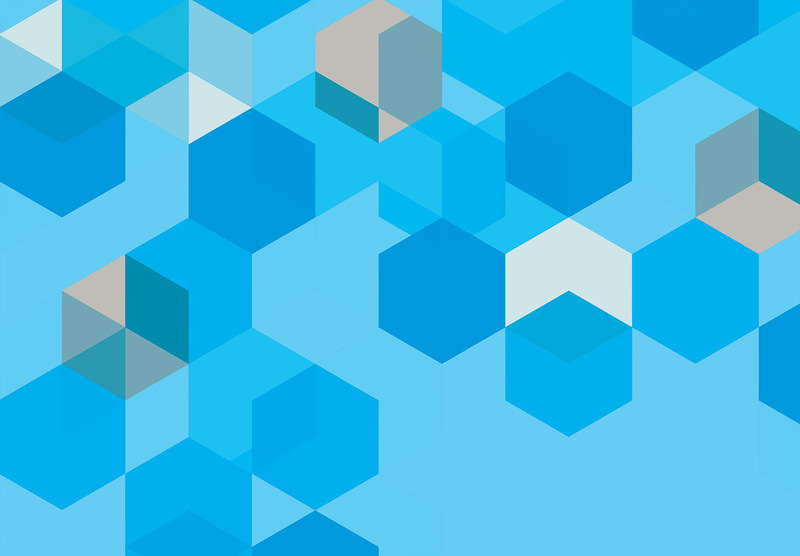 By equipping them with a highly modular and customizable content block system—in stark contrast to a typical template driven system—editors have the freedom to build and fill layouts based on the content, not the other way around. This website won a PRSA Philadelphia Pepperpot Award.